-- Rep. Joe Crowley's (D, NY-14) primary loss represents a changing of the guard in a diverse district. It does not necessarily suggest we should expect a flood of additional Democratic primary losers. As it stands, only three incumbent House members have lost renomination so far this cycle (Crowley, plus two Republicans). -- Tuesday's primary night was otherwise uneventful, and the president had a good night. -- We have half a dozen House ratings changes, all in favor of Democrats. More below. Going into Tuesday night, no Democratic House member had been denied renomination in a primary, and all but one won their primaries on Tuesday. Yet the one exception was the fourth-ranking member of the Democratic caucus: Rep. Joe Crowley (D, NY-14), who was toppled by liberal activist Alexandria Ocasio-Cortez (D), a member of the Democratic Socialists of America. Ocasio-Cortez's victory likely had a lot to do with the changing demographics of New York City. This particular district, which covers parts of Queens and the Bronx, is three-quarters nonwhite and about half Hispanic. Murmurs about the possibility of an upset prompted us to suggest last week that whoever followed Crowley in this district probably would be nonwhite 1. That said, few expected that Crowley would be replaced so soon. Crowley was of a breed of politician -- white men with ethnic European surnames who worked their way through the local party structure -- that used to dominate big city Democratic politics. But the future of the Democratic Party, particularly in very diverse urban areas like New York City, looks much more like Ocasio-Cortez than Crowley. Hillary Clinton won NY-14 77%-20% in 2016, so the Democratic primary is tantamount to election. A couple of other Democratic House incumbents in New York City, Reps. Yvette Clarke (D, NY-9) and Carolyn Maloney (D, NY-12), also had much harder primaries than they're used to. One other senior Democrat to watch in future primaries is Rep. Michael Capuano (D, MA-7), who faces African-American Boston City Councilor Ayanna Pressley (D) in a majority-minority Boston-based district. This also should be a lesson to people who want to get involved in politics: Sometimes long-time incumbents are less imposing than they appear. It's impossible not to compare Crowley's defeat to the fall of House Majority Leader Eric Cantor (R) in a 2014 primary against now-Rep. Dave Brat (R, VA-7). Cantor's loss was part of a larger anti-establishment Republican wave that culminated in the nomination and election of Donald Trump as president. And yet, Cantor's loss was complicated 2 and not just about national factors; the same is true of Ocasio-Cortez's victory. It sounds like she just outworked Crowley 3, who hadn't faced a real challenge since being gifted his seat by his predecessor two decades ago 4. Additionally, while it feels like there was a flood of incumbent Republican losers that coincided with Cantor, he was just one of three Republican House members to lose primaries in 2014. In other words, don't assume Ocasio-Cortez's victory is necessarily part of a broader revolution on the Democratic side. The battle for the party's future is more of a 2020 question anyway, when the party will pick a presidential candidate and, with that, a clearer future direction. -- Gov. Henry McMaster (R-SC) avoided becoming just the second sitting South Carolina governor to lose a primary, beating businessman John Warren in a runoff. McMaster took over as governor after Nikki Haley (R) became ambassador to the United Nations. McMaster starts as a big favorite over state Rep. James Smith (D). -- Rep. Dan Donovan (R, NY-11) easily defeated former Rep. Michael Grimm (R) on Staten Island. Grimm, a convicted felon, looked capable of beating Donovan, but Trump endorsed Donovan and the incumbent rallied. Trump had a good night: He backed McMaster and Donovan, and both won. -- Former NAACP President Ben Jealous (D) will face Gov. Larry Hogan (R-MD). Hogan is very popular but could be vulnerable to an upset in a blue state in a blue year. That said, top state Democrats like House Minority Whip Steny Hoyer, Sen. Chris Van Hollen, and former Gov. Martin O'Malley backed Prince George's County Executive Rushern Baker, the runner-up. We have a number of House ratings changes this week unrelated to Tuesday's primaries. If Democrats do in fact have a strong midterm election, the twin gubernatorial elections in New Jersey and Virginia from last November will be seen, historically, as midterm harbingers: Democrats strongly won both state governorships and, in Virginia, made large inroads in the state House of Delegates. This year, both states are becoming increasingly promising sources of Democratic House hopes. Let's start in the Garden State. State Sen. Jeff Van Drew (D), noted previously here as a strong Democratic recruit in an open South Jersey swing seat 5, is well-positioned in the open NJ-2, held by retiring Rep. Frank LoBiondo (R), a moderate who long frustrated potential Democratic opponents. Meanwhile, Republicans appear to have nominated a dud against him, former Atlantic County freeholder Seth Grossman (R), who has been making news for a history of outlandish comments 6. NJ-2 moves from Leans Democratic to Likely Democratic. Rep. Tom MacArthur (R, NJ-3) will be extremely well-funded thanks to his personal largesse, but he could face a stiff challenge from Andy Kim (D), a former Obama administration national security official. We're moving this race from Likely Republican to Leans Republican, but two caveats: The first is that NJ-3 is a very expensive and inefficient district to target in advertising, because it's split roughly evenly between the New York City and Philadelphia media markets, and the second is that Democrats bemoaned how the district was modified in post-2010 redistricting. Cherry Hill, a Democratic Philadelphia suburb, was carved out of the district, and although the district still voted for Barack Obama in 2012, it flipped to Trump in 2016. NJ-3 still ranks clearly behind three other New Jersey districts as Democratic pickup opportunities -- the aforementioned NJ-2, as well as NJ-7, a Toss-up seat held by Rep. Leonard Lance (R), and the open NJ-11 -- but it's a better Democratic target than our Likely Republican rating indicated. In the Old Dominion, Rep. Barbara Comstock (R, VA-10) has long stood out as clearly endangered, and Democrats nominated their most experienced potential challenger against her, state Sen. Jennifer Wexton (D). Monmouth University found 7 Wexton up about 10 points on Comstock. We were straining to give Comstock the benefit of the doubt, but we just don't think that's warranted anymore: Wexton is now a favorite as the race moves from Toss-up to Leans Democratic. A word of caution to Democrats, though: Sometimes the most vulnerable incumbents pull out victories, even in wave years 8. Statewide, we know Republicans are very worried about bomb-throwing Prince William County Board of Supervisors Chairman Corey Stewart's (R) Senate candidacy, and there's little indication he'll really push Sen. Tim Kaine (D-VA). Kaine very well could run ahead of Gov. Ralph Northam's (D) nine-point 2017 victory over former Republican National Committee Chairman Ed Gillespie (R), who barely beat Stewart in the 2017 GOP primary. Gillespie performed poorly in typically Republican suburban areas, such as the House districts held by Reps. Scott Taylor (R, VA-2) and Dave Brat (R, VA-7), and many believe Stewart is likely to do even worse. While Trump won both districts in 2017, Northam actually carried the Hampton Roads-based VA-2, and almost carried VA-7, a suburban Richmond district that reaches up into more rural parts of Central Virginia. Democrats also nominated promising though unproven candidates in both seats: former Navy commander Elaine Luria (D) against Taylor, and ex-CIA officer Abigail Spanberger (D) against Brat. The combination of credible challengers and a challenging national environment that may be exacerbated in Virginia's three big urban areas by Stewart's candidacy prompts us to push both VA-2 and VA-7 from Leans Republican to Toss-up. We don't know how well primary results and turnout may predict the races in the fall, although there are some very promising turnout trends 9 for Democrats in several key districts, as the New York Times observed earlier this week. But the top-two primary in California may provide more of a preview than most places, because all candidates compete on the same ballot. Generally speaking, Democrats improve from the primary to the general in California, or at least that's been the usual (not universal) trend from 2012, 2014, and 2016 (2016 is the weakest case). Democrats also tended to improve from primary to general in an earlier era when California used a top-two primary system, 1998 and 2000 (as former National Journal analyst Quinn McCord noted in advance of the return of the top-two in 2012 10). We wrote 11 about this at length prior to the primary. Note: Results are as of Wednesday morning and are not quite final -- they should be finalized by next week. The fourth column shows the average Democratic House vote share in the top-two primaries in 2012, 2014, and 2016. The fifth shows the current Democratic vote share in the 2018 primary. The sixth column compares the 2018 Democratic vote share with the average Democratic vote share from 2012 through 2016. And, finally, the seventh shows the average growth in the Democratic share from the primary to the November general election in the last three elections. *2012-2014-2016 average column only includes 2012 and 2016 elections because two Republicans advanced to the general election in 2014 in both CA-4 and CA-25. Note that Democrats actually led the two-party vote in CA-49, which we rate as Leans Democratic, and they significantly improved on their usual showing in several other districts that are traditionally Republican and were not seriously contested by Democrats last cycle but voted for Hillary Clinton in 2016: CA-39, CA-45, and CA-48. Two of those three seats we already had at Toss-up, and we're moving CA-45 from Leans Republican to Toss-up, too. Rep. Mimi Walters (R) only got about 53% of the two-party vote, a significant drop from usual GOP performance in the district. It seems possible that Clinton's 49%-44% victory in the district was a harbinger of increased competitiveness. Republicans hope to paint law professor Katie Porter (D) as too liberal for the district, and Porter did beat out a seemingly more moderate candidate, another law professor named Dave Min (D), in the first round of voting. Porter backed single-payer health care 14, while Min did not. Walters, meanwhile, is a reliable conservative vote in Congress 15, and she backed both the House's Affordable Care Act overhaul (which died in the Senate) and the GOP's tax cut. So voters will have a clear ideological choice in a traditionally Republican district where the president is nonetheless likely more of a liability than an asset. The primary results don't suggest Walters is doomed to lose; rather, they just indicate that Walters is no longer a clear favorite. We're looking at the primary results as something of a ceiling for Republicans in these seats, and if one believes that, then the GOP showings in these districts help justify our Toss-up ratings in CA-45 and elsewhere. The California calculus is this: Democrats likely need to net several seats from California to win the House. We've suggested their goal should be five total 16, and that is a high bar. They are favored in one GOP-held district, CA-49, as well as in all 39 of the current seats they hold. 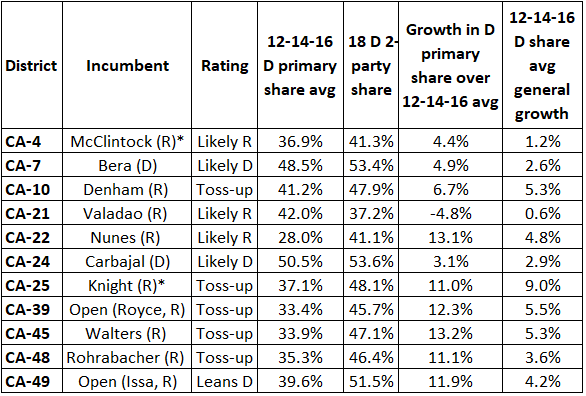 Then, there are five additional Toss-ups: CA-10, CA-25, CA-39, CA-45, and CA-48, and Democrats have some other, more fringe targets noted in Table 2. The primary results, now almost complete, suggest the Democrats can capture several of these Toss-up districts if they can boost their primary share of the vote by just a few points in November. History shows that they can, but it's hard to be confident that they will, so that's why there are so many Toss-ups. Turnout in the June primary was very high: It's comparable to the total number of votes cast in the 2014 general election, so it's possible that Democrats already showed their turnout hand in June and that their vote shares in these key districts won't go up by enough in the fall. Control of the House may hinge on this question given California's outsized importance in the Democrats' House plans. We're not moving off our long-held belief that House control is something of a 50-50 Toss-up, but our seat-by-seat handicapping is only getting better for Democrats. Today's seven ratings changes are all toward the Democrats, and the overall ratings now show 208 seats at least leaning to the Republicans, 199 at least leaning to the Democrats, and 28 Toss-ups. To win the House under the current ratings, Democrats would have to win two-thirds of the Toss-ups. In the event of a good Democratic environment in the fall, that would not be unreasonable to expect.